39% of SNS-using adults say they frequently see acts of generosity by other SNS users and another 36% say they sometimes see others behaving generously and helpfully. By comparison, 18% of SNS-using adults say they see helpful behavior “only once in a while” and 5% say they never see generosity exhibited by others on social networking sites. 15% of adult SNS users said they had an experience on the site that ended their friendship with someone. 12% of adult SNS users had an experience that resulted in a face-to-face argument or confrontation with someone. 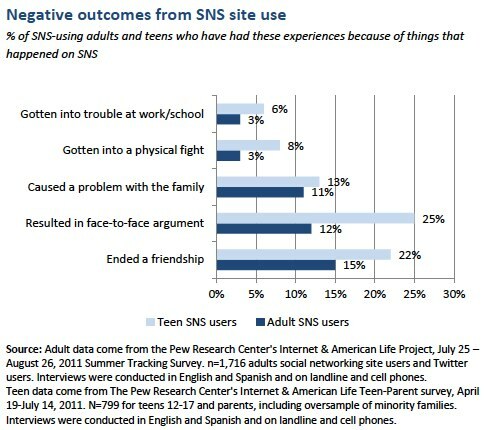 11% of adult SNS users had an experience on the site that caused a problem with their family. 3% of SNS-using adults said they had gotten into a physical fight with someone based on an experience they had on the site. 3% of adult SNS users said their use of the site had gotten them in trouble at work because of something that happened on the site. In addition, 13% of adult SNS users said that someone had acted in a mean or cruel way towards them on a social networking site in the past 12 months. Adults are generally more positive and less negative than teens about the behavior of others and their own experiences on social networking sites. As a rule, more adults than teens reported positive results on SNS. For instance, a higher proportion of adults than teens say their experience is that people are mostly kind on social networking sites. And significantly smaller proportions of adults have had bad outcomes based on their SNS use such as confrontations, lost friendships, family strife, and fights. Overall, the two surveys show that 41% of SNS-using teens have had at least one of the bad experiences we queried, compared with 26% of the SNS-using adults. When they see mean or aggressive behavior on social networking sites, adults are more likely than teens to ignore it and not get involved. Compared with teen SNS users, adults are somewhat more likely to stand back, not get involved, and ignore the offensive behavior. For instance, 45% of adult SNS users who have witnessed problems say they frequently ignore offensive behavior online, compared with 35% of SNS-using teens who say they frequently ignore offensive behavior. Some 34% of adult SNS users say they never confront the person being offensive, compared with 21% of SNS-using teens who never take that step. Some 29% of adults who have witnessed problems never defend the person or group being attacked, compared with 19% of teens who never take that action. At the same time, adults who have seen harassment on SNS are a bit less likely than teens to say they join in the harassment that they see occurring on social networking sites. Some 19% of teen SNS users said they at least occasionally join in the mean and offensive behavior that is being directed at another SNS user, compared with 15% of adults who say they join in at least occasionally. Interestingly, there is a split when it comes to the behavior of men and women when they see a people acting meanly on a social networking site. Men are more likely to ignore a problem they see on a social networking site and women are more likely to respond. 26% of SNS-using women will frequently tell a person to stop attacking someone on a social networking site, but only 19% of SNS-using men will do that frequently. At the same time, 41% of men say they never tell someone to stop harassing another person on a social networking site, while only 29% of women say they never take action when they see a problem unfolding. Similarly, 28% of SNS-using women say they frequently defend a person or group that is being harassed or insulted, while only 19% say they will frequently do so. At the same time, 33% of SNS-using men say they never defend a person or group that is under attack on a social networking site, compared with 25% of women who say they never defend someone under attack. Minorities, women, parents, and Millennials are most likely to witness offensive material on social networking sites. 42% of black SNS users said they frequently or sometimes saw language, images or humor on SNS that they found offensive, compared with 22% of white SNS users. In addition, 33% of Hispanic SNS users said they encountered such material that often, notably higher than whites. 34% of Millennial generation SNS users – those ages 18-34 – said they frequently or sometimes saw language, images or humor on SNS that they found offensive, compared with 17% of SNS users in GenX (those ages 35-46). Even smaller percentages of SNS-using Baby Boomers and retirees said they had encountered such material. 29% of women SNS users said they frequently or sometimes saw language, images or humor on SNS that they found offensive, compared with 22% of men. 29% of SNS users who are parents with minor children said they frequently or sometimes saw language, images or humor on SNS that they found offensive, compared with 24% of nonparents.